Saucony Hurricane ISO 4 are stability cushioned running shoes. 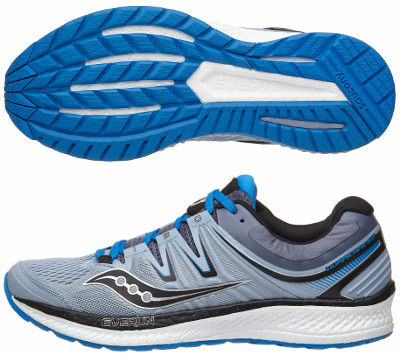 Like in previous editions the premium Saucony Hurricane ISO 4 has been released after its popular counterpart for neutral runners Triumph ISO 4 including several solutions for progressive pronation support like medial post. It is interesting to see the progress regarding design of stability running shoes because at the beginning they were really ugly and right now it is difficult to distinguish them from neutral counterparts without thorough examination. Its smaller sibling Guide ISO is available for those looking for lighter running shoe featuring less pronation correction. Besides EVERUN in midsole, the other major change compared with its predecessor Hurricane ISO 3 is the better integration of the ISOFIT system within the upper allowing more natural dynamics while featuring snug fit. Multi layer engineered mesh promotes good ventilation with plenty of holes forefoot and secure fit with more dense fabric in other areas. Heel counter (Support Frame) has been redesigned and now is no longer an external piece (like in disruptive Liberty ISO) but integrated to offer enhanced stability. Molded foam collar is made of RUNDRY™ fabric for great breathability and odour control resulting in optimal sanitation and with increased thickness reduces gap around the heel keeping eveything in place. The other major change in Hurricane ISO 4 is the flagship foam from Asics EVERUN which replaces veteran PWRGRID+ as main component in midsole although not the only one present (impressive EVA medial post features progressive but solid pronation support) unlike Adidas does with Boost™ in Adidas Supernova ST. Outsole is almost the same as the one seen in Triumph ISO 4 keeping TRI-FLEX configuration in forefoot and rubbers (well known iBR+ and XT-900) featuring different hardness depending on the area to increase durability. In order to promote smoother transition, new grooves are available in the forefoot (making EVERUN visible) which allow limited expanding for better ground adaptation.